Alphonse Gabriel Capone was born in Garden City, New York to Gabriel (December 12, 1864 – November 14, 1920) and Teresina Capone (December 28, 1867 – November 29, 1952), on January 17, 1899. Gabriel was a barber from Castellammare di Stabia, a town about 15 miles south of Naples, Italy. Teresina was a seamstress and the daughter of Angelo Raiola from Angri, a town in the province of Salerno. Gabriele and Teresina had 8 children: Vincenzo Capone (1892 – October 1, 1952), Raffaele Capone (who was also known as Ralph Capone and later placed in charge of Al Capone's beverage industry; January 12, 1894 – November 22, 1974), Salvatore Capone (January 1895 – April 1 , 1924), Alphonse "Scarface Al" Capone (January 17, 1899 – January 25, 1947), Umberto Capone (1906 – June 1980), Matthew Capone (1908 – January 31, 1967), Rose Capone (born and died 1910) and Mafalda Capone (later Mrs. John J. Maritote, January 28, 1912 – March 25, 1988). The Capone family immigrated to the United States in 1893 and settled at 95 Navy Street, in the Navy Yard section of downtown Brooklyn, near the Barber Shop that employed Gabriele at 29 Park Avenue. When Al was 11, the Capone family moved to 38 Garfield Place in Park Slope, Brooklyn. Capone dropped out of the Brooklyn public school system at the age of 14, after being expelled from Catholic School 133. He then worked at odd jobs around Brooklyn, including in a candy store and a bowling alley. During this time, Capone was influenced by gangster Johnny Torrio, whom he came to regard as a mentor figure. After his initial stint with small-time gangs, including The Junior Forty Thieves, Capone joined the Brooklyn Rippers and then the notorious Five Points Gang. He was mentored by and employed as a bouncer and bartender in a Coney Island dance hall and saloon called the Harvard Inn by racketeer Frankie Yale. It was in this field that Capone received the scars that gave him the nickname "Scarface"; he inadvertently insulted a woman while working the door at a Brooklyn night club, provoking a fight with her brother Frank Gallucio. Capone's face was slashed three times on the left side. Capone apologized to Gallucio at Yale's request and would hire his attacker as a bodyguard in later life. When photographed, Capone hid the scarred left side of his face and would misrepresent his injuries as war wounds. According to the 2002 magazine from Life called Mobsters and Gangsters: from Al Capone to Tony Soprano, Capone was called "Snorky" by his closest friends. On December 30, 1918, Capone married Mae Josephine Coughlin, an Irish woman. Earlier that month she had given birth to their son, Albert Francis ("Sonny") Capone. Capone's departure from New York, with his family, to Chicago is believed to have occurred in 1921. Capone purchased a modest house at 7244 South Prairie Ave. in the Park Manor neighborhood on the city's south side in 1923 for USD $5,500. 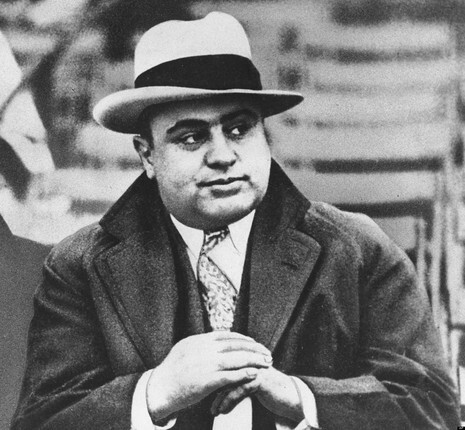 Capone came at the invitation of Torrio, who was seeking business opportunities in bootlegging following the onset of prohibition. Torrio had acquired the crime empire of James "Big Jim" Colosimo after the latter refused to enter this new area of business and was subsequently murdered (presumably by Frankie Yale, although legal proceedings against him had to be dropped due to a lack of evidence). Capone was also a suspect for two murders at the time, and was seeking a better job to provide for his new family. Capone was born on January 17, 1899, in Brooklyn, New York. Baptized "Alphonsus Capone," he grew up in a rough neighborhood and was a member of two "kid gangs," the Brooklyn Rippers and the Forty Thieves Juniors. Although he was bright, Capone quit school in the sixth grade at age fourteen. Between scams he was a clerk in a candy store, a pinboy in a bowling alley, and a cutter in a book bindery. He became part of the notorious Five Points gang in Manhattan and worked in gangster Frankie Yale's Brooklyn dive, the Harvard Inn, as a bouncer and bartender. While working at the Inn, Capone received his infamous facial scars and the resulting nickname "Scarface" when he insulted a patron and was attacked by her brother.